I’ve been on a major chocolate kick (when am I not!! ), but this particular time has gotten me into all things chocolate-covered. Every Christmas my mother-in-law would take a bunch of raisins, put them in mini cupcake liners, and cover them with chocolate…..pure bliss! 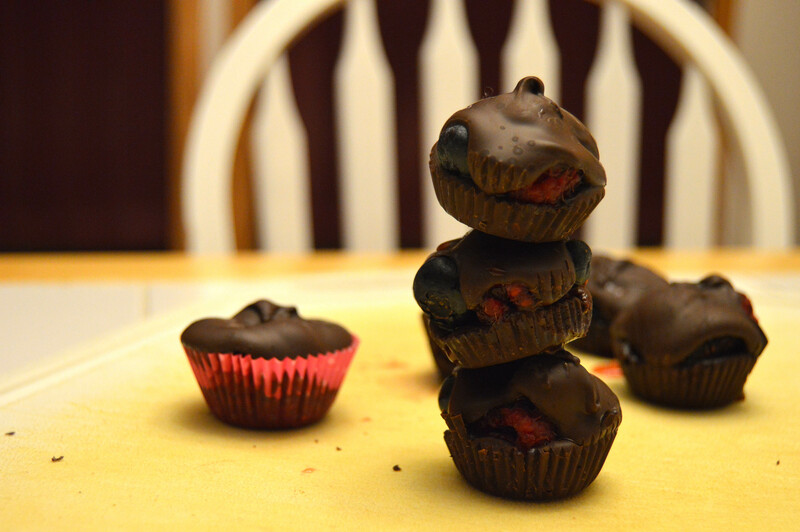 Recently I’ve been going through Pinterest and pinning all kinds of chocolate-related stuff, then the thought hit me about the recent strawberry purchase and feeding the tot blueberries, raspberries and blackberries….let’s combine these things….OMG! !….Chocolate cover all of these things!!! I took the idea from my mother-in-law, but with berries. It’s so simple to do, and so dangerous to any chocolate craze!! Now the taste buds feel better, and you also get your healthy antioxidants too! 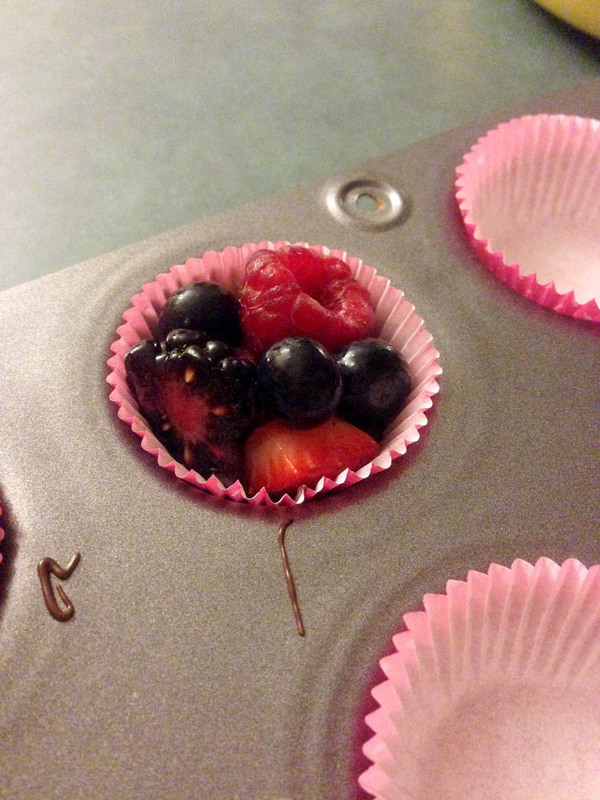 Line a mini muffin pan with liners, set aside. Wash and cut your fruit. Place each type of fruit in individual bowls. For the chocolate, place about half the bag of chocolate chips into a microwave-safe dish. Microwave until chocolate is melted and smooth, but be sure to stir every 30-40 seconds to help with melting and to prevent the chocolate from getting dry and crispy. 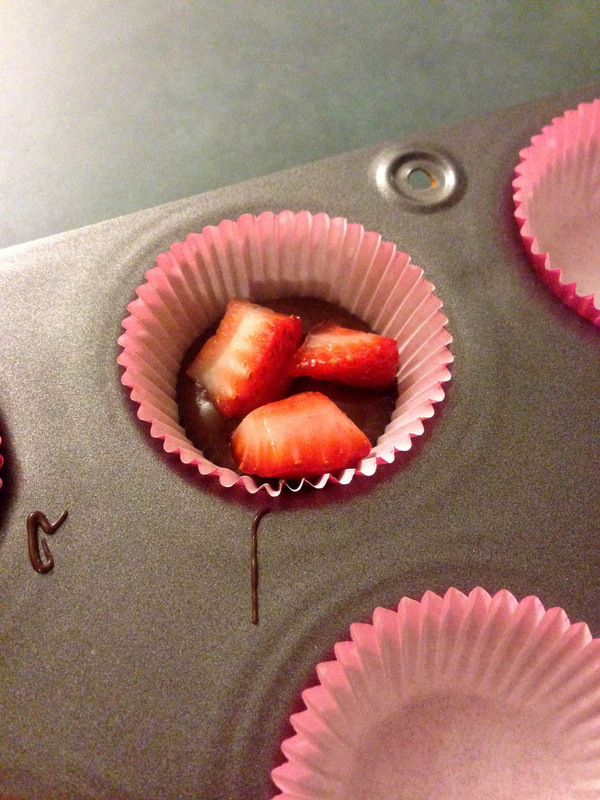 Once chocolate is melted, pour about 1 teaspoon of chocolate into the bottom of each mini-cupcake liner. Place two or three pieces of strawberries into the chocolate, then place one each of the blackberry and raspberry. Then top with 2 or 3 blueberries. Don’t overload each liner. Take a heaping teaspoon of melted chocolate and pour over top of berries, allowing the chocolate to ooze right through to the bottom. Allow time for chocolate to set, or if you are in a hurry, place the mini muffin pan into the refrigerator until the chocolate is set. 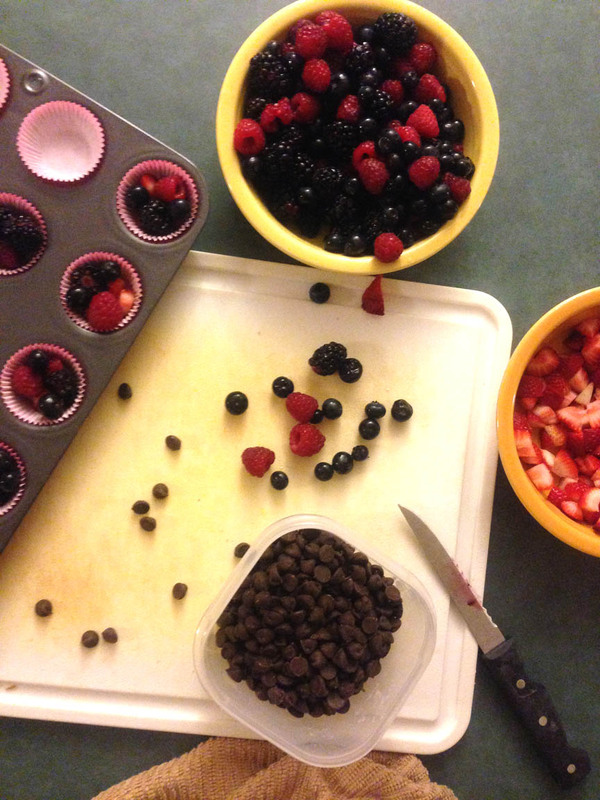 Once set, remove chocolate-covered berries from mini muffin pan, and enjoy!! *If using chocolate bark, place two or three blocks into a microwave-safe dish and microwave for about a minute, depending on how many blocks you melt. Be sure to stir every 40 seconds!